Yawn: The Origin Of The False Doctrine Of Sola Scriptura...Driving The Last Nail In The Coffin of Sola Scriptura? Over on the CARM boards a Roman Catholic quoted an article found on the Catholic Treasure Chest website as an authoritative polemic against Luther and sola scriptura. What was ironic was that this particular person earlier argued, "Jesus through Paul told us that the Church is the pillar and foundation of truth. He didn't tell us that we can believe whatever we want. Listen to the Church." He then went on to cite a more-or-less anonymous layman's webpage as... an authority! This is hardly a source of infallible truth as to what the Roman church declares about Martin Luther. For that matter, who is Bob Stanley (the author of The Origin Of The False Doctrine Of Sola Scriptura...Driving The Last Nail In The Coffin of Sola Scriptura)? If you search around Mr. Stanley's webpage, such information isn't forthcoming. Martin Luther (1483-1546) is to be given the credit for inventing the false doctrine of Sola Scriptura (Bible Only or Bible Sufficiency). This isn't accurate. 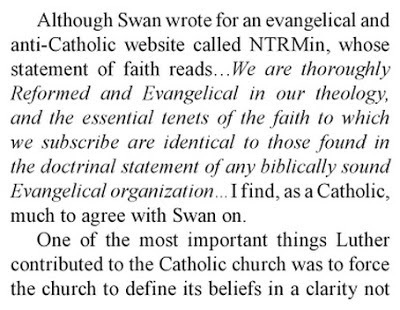 Even Roman Catholic scholars admit it. For instance, Franz Posset states in his recent book, The Real Luther, "As an aside, on the eve of the 'Reformation' there was a canonistic tradition supporting the assertion of the supreme authority of Scripture over councils or ecclesiastical authorities"(p. 63). He then argues that the reformed friary Luther joined had Constitutions, and in Chapter 17 of these it states "the following directive is given which suggests the meaning of the maxim Scripture Alone, '(A friar) is to read the Sacred Scripture avidly, listen to it devoutly, and learn it fervently. Sacram scripturam avide legat, devote audiat et ardenter addiscat.' "
"As long as it seems to me that the pope or theologians or any school assert a position contradicting the truth of Scripture, my concern for scriptural truth obliges me to give it first place, and after that I am bound to examine the evidence on both sides of the question, since it is unlikely the majority would err. But in every case I owe more respect to canonical Scripture than to human assertions, regardless of who holds them. "- Wessel Gansfort (1419-1489) [Heiko Oberman, Forerunners of the Reformation (New York: Holt, Rinehart and Winston, 1966),99-100]. No Christian ought "to subscribe to any statement of an assembly against his conscience, so long as it seems to him to assert anything contrary to Scripture." Wessel Gansfort (1419-1489) [Heiko Oberman, Forerunners of the Reformation (New York: Holt, Rinehart and Winston, 1966), 64]. He had separated himself from the authority of the Papacy and the Magisterium, and thereby so doing lost all authority regarding Church matters. Luther was deemed a heretic and excommunicated from the Roman church without a fair hearing. Luther swore an oath to uphold the Scriptures, it was an oath he was required to make by the Church of his day. In essence, one could argue that the Church, via this oath, required Luther to work toward reformation, and it was they that inadvertently called him to do so. However, since the Papacy balked at Luther's every move toward that end, it's obvious the Papacy would have never called forth any to reform the Church. The corrupt Papacy should have commissioned Luther to reform the corrupt Papacy and Church? ....now there is a likely scenario! "Luther's claim to authority as a teacher of God's Word is the common claim of every Christian who proves his belief from the Scriptures. The infallibility of the Scriptures becomes the infallibility of the teachers of Scripture. They can challenge the world as Isaiah did: "To the Law and to the testimony: if they speak not according to this word, it is because there is no light in them"; or Christ: "The Scripture cannot be broken"; or Paul: "Though an angel from heaven preached other gospel to you than that which we have preached unto you, let him be accursed!" (source). "In the interest of peace in the empire, moreover, Luther and his Wittenberg colleagues were prepared to make major concessions to the jurisdictional authority of the Catholic bishops. Accordingly, at the Diet of Augsburg in 1530, Melanchthon, acting with the full knowledge and support of Luther and the Saxon government, offered restitution of the jurisdiction of the Catholic bishops over the Evangelical congregations on the condition that the bishops ordain Evangelical priests and recognize the legitimacy of Communion in both kinds, clerical marriage, and the Mass in German. This offer remained on the table through all the failed attempts of the 1530's and 1540's to find a peaceful solution to the religious divisions in the empire" (LW 59:276). He then turned to the Bible, a book, as the sole source of authority. Can a book ever be a sole source of authority? Can the Constitution of the United States stand alone without an authoritative body to interpret it? What authoritative body is there to resolve disputes between opposing interpretations of the laws written within it? How long would this country have lasted if the founding fathers had not had the foresight to establish a Supreme Court, which has the final word in the interpretation of the Law of the Land? This country would have been split into factions right from the very beginning. Luther is simply one of a number of people throughout history that have held Scripture as the sole infallible rule for the church. This does not deny that there are other authorities over the life of a Christian, but it does deny that there are other infallible authorities over the life of a Christian. All authorities less-than-God are subject to the sole infallible rule of the Scriptures. 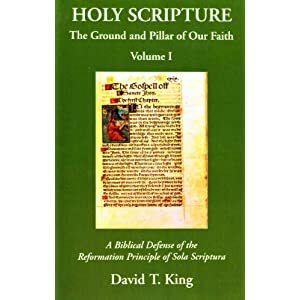 See William Webster and David King's, Holy Scripture: The Ground and Pillar of Our Faith Volume III- The Writings of the Church Fathers Affirming the Reformation Principle of Sola Scriptura (WA: Christian Resources, 2001). There are numerous people throughout history that look to Scripture as the sole infallible rule, and likewise recognize lesser authorities governing the life of the church. See some examples, here. The very earliest mention of the false doctrine of Sola Scriptura was by Martin Luther as he was questioned in the Synod of Augsburg (Germany) in October 1518. This claim that sola scriptura originated with Luther was shown to be blatantly false above. Reformation historians don't typically refer to Luther's meeting with Cajetan as "the Synod of Augsburg." In fact if you Google "Synod of Augsburg" you'll get hits to many different meetings. Further, I'd be interested in seeing any statement from Luther using the phrase "sola scriptura" during his meetings with Cajetan. 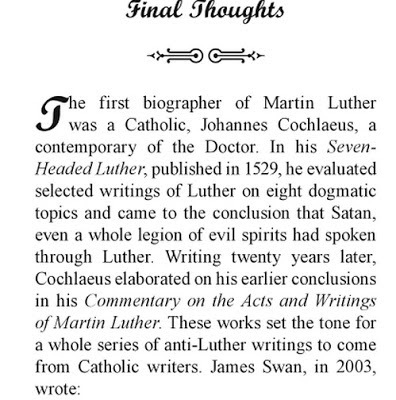 On the other hand, Luther certainly argued against Cajetan using the authority of the Scriptures. Interestingly, Cajetan argued during this meeting that the Pope was above councils and Scriptures. Now you tell me if Cajetan actually had the correct view of Rome's authority during this meeting? If you think Luther was guilty of false doctrine, you should throw Cajetan in with Luther as well. In his appeal to the Council, Luther placed the Bible and his interpretation of it, above the Pope. Certainly Luther and Cajetan discussed authority, and, as I stated above, Cajetan placed the Pope over both the Scripture and Council. The reason for this sort of confusion is the Roman Church didn't have this stuff completely worked out. That is, Luther and Cajetan weren't discussing something new, they were discussing an authoirty issue that had been around for a long time. As to Luther's "interpretation", you seem to assume Rome has actually infallibly interpreted the Bible. Demonstrate then what Bible passages Luther interpreted while in dialog with Cajetan were against an infallibly defined Biblical text. Even so he admitted the authority of the Synod and of the Bible were equivalent, only in the hope that the Synod would give him a favorable decision. I'd be very interested in seeing anything from the October 1518 negotiations with Cajetan in which Luther did this. I simply don't recall this from Augsburg, October 1518. This point appears to be directly taken from Grisar on page 338, a point that Grisar doesn't footnote. He may be referring to Luther's account of his meeting with Cajetan at Augsburg (WA 2; LW 31) since that's the context he's working in. There Luther argues for the authority of the scriptures over a pope or council. In the Leipzig Disputation in July 1519, Luther went a step further and declared that Scripture ranked above a Church Council, and that Ecumenical Councils had already erred in matters of faith. As a result he was branded a heretic. Certainly many of the papists thought Luther to be a heretic before 1519, but it's my understanding he was officially deemed a heretic at the Diet of Worms in 1521. As to Luther going "a step further" this ignores the sort of people Luther was up against. They were arguing things like, "He who does not hold the teaching of the Roman Church and the Pope as an infallible rule of faith, from which even Holy Scripture draws its power and authority, he is a heretic." There seems to be a contradiction here, as Luther was a Catholic Augustinian Monk, and therefore was well aware that it was Catholic Church Councils which finalized the canons of both the Old and the New Testaments. Now at Leipzig, he declared that the product of the Councils ranked above the Councils themselves. Luther learned about the Scriptures, Baptism, and the Pulpit, etc. from the church of his day, in the same way the Prophets were born into a society in which the religious structure of their day was functioning, and gave the Old Testament people a religious context to live in. The visible church indeed promulgated the Scriptures and Christian doctrine. Who can deny this? But simply because they did so, does not mean a council of the visible church in Rome infallibly declared the canon of Scripture. Luther held that the Church was God's hand maid and servant. It does not create God's Word, God's Word creates the Church. As the servant of the Word, it gives the Word to the body of Christ, His people. As creatures we are dependent on God's purposes in giving us His inspired Scriptures. God "providentially preserves the Scriptures and leads His people to a functional sufficient knowledge of the canon so as to fulfill His purposes in inspiring them" (James White, Scripture Alone, p. 103). For God to do this, His Church need not be infallible. God's people though have recognized God's Word long before any alleged infallible magisterium came along. "As the various writings of the OT originated and became known, they were also recognized as authoritative. The laws of YHWH were deposited in the sanctuary (Exod. 25:22; 38:21; 40:20; Deut. 31:9, 26; Josh. 24:25f. ; 1 Sam. 10:25). The poetic products were preserved (Deut. 31:19; Josh. 10:13; 2 Sam. 1:18); at an early stage the Psalms were collected for use in the cult (Ps. 72:20); the men of Hezekiah made a second collection of the Proverbs (Prov. 25:1). The prophecies were widely read: Ezekiel knows Isaiah and Jeremiah; later prophets based themselves on earlier ones. Daniel (9:2) is already familiar with a collection of prophetic writings including Jeremiah. In the postexilic community the authority of the law and the prophets is certain and fixed, as is clear from Ezra, Haggai, and Zechariah. Jesus Sirach has a very high view of the law and the prophets (15:1-8; 24:23; 39:1f. ; 44-49). In the preface his grandson mentions the three parts in which Scripture is divided. The LXX contains several apocryphal writings, but these themselves witness to the authority of the canonical books (1 Macc. 2:50; 2 Macc. 6:23; Wisdom 11:1; 18:4; Baruch 2:28; Tob. 1:6; 14:7; Sir. 1:5 [marg. ]; 17:12; 24:23; 39:1; 46:15; etc.). Philo cites only the canonical books. The fourth book of Ezra ([= 2 Esdras] 14:18-47) knows of the division into 24 books. Josephus counts 22 books divided into three parts. In the opinion of all concerned, the OT canon of Philo and Josephus was identical with ours." [Reformed Dogmatics I, 393-394]. Luther was warned by the Church in June 1520, in the Papal Bull "Exsurge Domine". The Church did everything it could to reconcile with him but he refused, thus setting the stage for his self ex-communication. This is simply wishful thinking. Cajetan actually shouted down Luther loudly yelling "Recant!" at him. 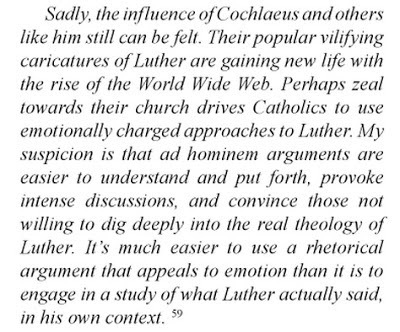 This is simply one example of the nonsense Luther was subjected to from Rome's defenders. "As a legal document Exsurge Domine presumed the theological refutations provided by Prierias, Cajetan, and, most demonstrably, Eck. The brief denunciations and an incomplete statement of Luther's teachings provide little opportunity for determining the finer points of magisterial objections to the reformer (Hillerbrand 1969, 108-112). The document contains no hierarchy of condemnation, never distinguishing which of the forty-one errors are heretical doctrinally and which are merely "offensive to pious ears" [Gregory Sobolewski, Martin Luther Roman Catholic Prophet (Milwaukee: Marquette University Press, 2001), pp. 67-68]. He was formally ex-communicated on January 3, 1521 through the Papal Bull 'Decet Romanum Pontificem'. Exsurge Domine said that the Pope could, "without any further citation or delay, proceed against him to his condemnation and damnation..." Decet Romanum Pontificem spoke of Luther's "depraved and damnable purpose." It called for any of the faithful who were sympathetic to the Lutherans to shun them, so that they "may escape divine vengeance and any degree of participation in their damnation." It further declared concerning Luther and his followers: "...these and the other sentences, censures and punishments... we decree to have fallen on all these men to their damnation." However, the great German Catholic historian from the Universities of Breslau and Bonn, Hubert Jedin held that Catholicism never condemned Luther by name at Trent, and that no official judgment on Luther exists by which a loyal Catholic is bound. Isn't that an irony? The very man the Catholic Treasure Chest thinks is so awful has no actual infallible ruling against him from Rome. A secular Council called the "Diet of Worms" was convened by the Catholic Emperor Charles V in April 1521, and Luther was again asked if he was going to retract, or maintain, the ideology of his many books. Luther stood firm. An Edict issued by this Council in May 1521, branded Luther as a heretic and an outlaw. Well, Bob Stanley said above he was branded a heretic in 1519. Which is it? This is the problem with doing cut-and-paste on a discussion board: The material cut-and-pasted can bite you if one doesn't check it carefully. For those interested in the Reformed and Lutheran Together movement, this post is insightful: Gazing Wrongly at the Right Thing. 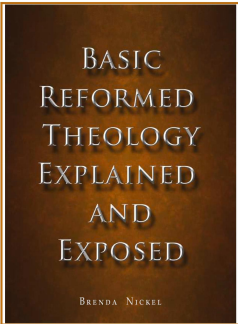 "...the Lutheran and Reformed traditions are, when understood and practiced properly, Christ centered. But it is possible to become Patricentric in our thinking as Christians, and that is a thing we ought to avoid at all cost." Well said. This post is a nice breath of fresh air. For those not interested in the Reformed and Lutheran Together movement, may I suggest a curious (for lack of a better word) Lutheran blog, Back To Luther... and the old (German) Missouri Synod. This blogger has put together a number of helpful posts in regard to Luther research. He recently compiled links to the Saint Louis Edition of Luther's Works, as well as alerting me the fact that Vogel's Cross Reference of Luther's Works is now back in print (this is a book I've wanted to get for years). He's also compiled Luther's Timeline – events surrounding Luther (w/ download), and Luther's Letters – largest cross reference available. This is great stuff for those of you interested in Reformation-related history. This is the sort of stuff that interests me the most in terms of research. I wish I came up with the above material! On the other hand, he also appears to have issues with Concordia Publishing (and Lutherans in general), so he makes PDF's available of books they're supposed to be printing. This seems a bit unscrupulous to me. I'm very grateful to the work Concordia Publishing does. They've put out some outstanding material. The recent volumes of LW are meticulously researched and brilliantly translated. In regard to customer service, they've been wonderful as well. I'm grateful for what they do. The last comment simply doesn't follow. One can "fully understand Martin Luther" or any other subject for that matter, by simply being a diligent student of history and theology. I can't be the only narcissist that every so often, types their own name into Google to see what comes up. The results don't always flatter, that 's for sure. For instance, this link, James Swan Chokes Mom, Smashes Head Through Wall, in Argument Over World of Warcraft, certainly besmirches those named "James Swan." That's all the text available from Google for preview of these pages. 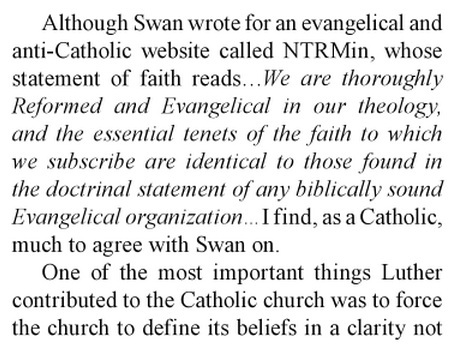 They're citing my old NTRmin article, The Roman Catholic Perspective of Martin Luther (Part One). I put this article together after dealing with a number of online Roman Catholics citing Luther via 100+ year-old Roman Catholic historians. 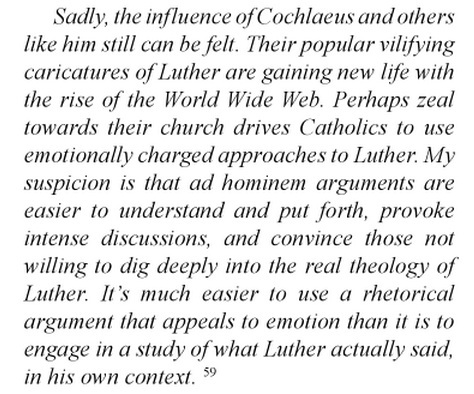 Not only did I discover that online Roman apologists hadn't actually read Luther in context, but that those historians they were citing were, for the most part, not even taken seriously by later Roman Catholic historians. Had these men alerted me of their book back in 2005, I certainly would have obtained it and reviewed it. Perhaps I still will. On the other hand, I've not said anything in the above quote that hasn't been said by historians actually worthy of citing. I'm merely parroting back what's been said and documented for a long time. Update: As I suspected, this thread over on Catholic Answers got shut down. What's interesting is that they deleted a number of posts (including mine) and allowed the discussion to end with "Rosinante" getting the last word. It's fascinating that they would allow someone unrestrained mocking, and then allow them to get the last word. As my friend Algo taught me, with Catholic Answers, one needs to always make backup copies. Update (12/29/12): More editing has occurred over on the Catholic Answers discussion from which the posts below were taken. It appears all the posts below are now deleted. The discussion now ends with a moderator stating, "Return and stay on the topic...". The discussion is still locked and closed. Having myself been a large discussion board moderator in the past, that's a fair move. I'm not sure if anything I posted here had anything to do with it (I doubt Catholic Answers cares what I post), so whatever their reasons, they did the right thing. And the same to you. Be Blessed! ...then you refer me to "Yeah, but, but, but.DOT COM", a cite virtually acknowledging a multitude of such quotes from Marty (then lamely trying to spin them, or explain them away). But next time, may I kindly suggest owning that you are aware of Marty's various back peddles, but simply have a your own spin on them, to wihch you subscribe (or I'm sure you'd rather phrase it as you disagree with my characterizations thereof, or conclusions drawn therefrom....). Okham's razoor however, suggests rather compellingly, that Marty meant what he said--not what protestants wished he had meant by what he actaully said. I'm the unembarrassed author of "Yeah, but, but, but.DOT COM" whom you say "lamely" spins and explains away multitudes of Luther quotes in order to provoke laughs. I suggest before you make such remarks on a public forum, you actually provide cogent examples to prove your opinion. Saying something and proving something are two very different things. Third, the mere existence of your cite, indicates the need to 'explain away' Luther's back peddling. First, I didn't suggest you did it to 'provoke laughs'--that's just the reaction your cite provoked in me; Second, the point is that Luther actually made many of these comments, and the poster to whom my post was directed, feigned ignorance about the statemets (like me, feigning ignorance about the inquisitions); Third, the mere existence of your cite, indicates the need to 'explain away' Luther's back peddling. Rather than quibble about justifying your feelings and your harsh comments towards my website, I'll once again point out the obvious: before you make such remarks on a public forum, you actually need to provide cogent examples to prove your opinion. Saying something and proving something are two very different things. Here's your chance to substantiate your comments. Give me one example from the link that was suggested to you by JonNC and prove what I wrote was an exercise in explaining away Luther's back-peddling. Remember, this is "Catholic Answers". Here's your chance to prove that your Catholic answer to someone like myself is meaningful and convincing, and a reason why the Roman Catholic worldview is true. Simply saying "the mere existence of your cite, indicates the need to 'explain away' Luther's back peddling" is neither meaningful or convincing. It's simply an unsubstantiated opinion. No, this isn't true. You're showing your own ignorance here. As just one example of my point, one of the most extensive, accessible sources of the writings of Early Church Fathers on the internet is at CCEL, which is a Protestant site. I'm well aware of the protestant *attempt* to pirate the Church Fathers, particularly from the Calvinista camp (to which the author of "yeah but but but.dot com' acknowleged he belongs). My comment however, was directed at the poster's comment that citing this or that obscure source, carried no authority with pro's.--that could refer to various personalities grouped within the rather broad groupoing known as Church Fathers--especially since they cover a period in excess of the existience of protestantism itself. ...our seperated bretheren now seek to invoke the Church Fathers' 'traditions of men', as not only authoratative, but in support of their own anti-Catholic views? Some how, these very same authority figures whose words carry addtional weight due to their cred amongs the Church...somehow, they were always arguing for sola scriptura, and never really respected Sacred Tradition.. I'm well aware of the protestant *attempt* to pirate the Church Fathers, particularly from the Calvinista camp (to which the author of "yeah but but but.dot com' acknowleged he belongs). "Calvinsta camp" appears to be meant in a mocking way. I note this based on the context of the comment from which it came, which mentions that those who are not Roman Catholic express views which are "just laughable...even if not intended to be funny." Since Luther had this curious idea that our actions have no connections whatsoever with our thoughts, and that as long as we think in a Christian way, we need not behave accordingly, it is not surprising that he did not hesitate to authorize the commitment of sins. “What does it matter whether we commit a fresh sin?” he asks sarcastically. “Faith cancels all sin” is his simple counsel. “No other sin exists in the world save unbelief,” is his doctrine. Indeed, his old enemy, Satan, is once more coming to light in order to give an excuse to sinners. “Sometimes it is necessary to commit some sin out of hatred and contempt for the Devil.” “What matters if we commit a sin?” (E16, 254). WA 25:330 can be found here. This quote is from Luther's material on Isaiah 53. Some of the material is found in WA 31(2), some of it is found in WA 25 (pp. 79-401). The material in WA 31 comprises of lectures transcribed and recorded by those who heard Luther give these lectures. The material in WA 25 comprises of scholia. Therefore, taken together, Luther's notes and lectures comprise his material on the book of Isaiah. LW chose to translate the material from WA 31 with clarification from Luther's scholia ("... there is neither need nor even justification for relying on the scholia, and we have decided to translate the version closest to Luther himself"). This states the purpose of Christ’s suffering. It was not for Himself and His own sins, but for our sins and griefs. He bore what we should have suffered. Here you see the fountain from which St. Paul draws countless streams of the suffering and merits of Christ, and he condemns all religions, merits, and endeavors in the whole world through which men seek salvation. Note the countless sects who to this day are toiling to obtain salvation. But here the prophet says, “He for us.” It is difficult for the flesh to repudiate all its resources, to turn away from self, and to be carried over to Christ. It is for us who have merited nothing not to have regard for our merits but simply to cling to the Word between heaven and earth, even though we do not feel it. Unless we have been instructed by God, we will not understand this. Therefore I delight in this text as if it were a text of the New Testament. This new teaching which demolishes the righteousness of the Law clearly appeared absurd to the Jews. For that reason the apostles needed Scripture, Surely He has borne our griefs. His suffering was nothing else than our sin. These words, OUR, US, FOR US, must be written in letters of gold. He who does not believe this is not a Christian. Yet we esteemed Him. We thought that He was suffering because of His own sin, as it were. In the eyes of the world and of the flesh Christ does not suffer for us, since He seemed to have deserved it Himself. This is what the prophet says here too, that He was judged guilty in the eyes of the world. It is therefore difficult to believe that such a one suffered for us. The Law is that everybody dies for his own sins. Natural reason, and divine as well, argues that everybody must bear his own sin. Yet He is struck down contrary to all law and custom. Hence reason infers that He was smitten by God for His own sake. Therefore the prophet leads us so earnestly beyond all righteousness and our rational capacity and confronts us with the suffering of Christ to impress upon us that all that Christ has is mine. This is the preaching of the whole Gospel, to show us that Christ suffered for our sake contrary to law, right, and custom. He expounds more fully what His suffering for us means. What I find fascinating about this particular quote is the way it's interpreted three different ways. The website under scrutiny above uses it in regard to predestination. Peter Wiener thinks it means that since Christ has bore our sins, one "need not behave accordingly" and that God "ordained sins." Grisar comes closest to the actual correct understanding of the context, but his Latin translation makes it look as though Satan puts all sin in the heart, where the context shows it's the thought of regarding "sin as resting on you" that Satan places in the heart (Perhaps though this was simply something lost when Grisar was translated from German to English). This is a good example of why a context is so important! "In the morning you really look as though your heads had been pickled in brine." Yet, from the very passage in the Table-Talk where this is recounted, we learn that he said to the guests, again in a far too indulgent strain: "The Lord God must account the drunkenness of us Germans a mere daily [i.e. venial] sin, for we are unable to give it up; nevertheless, it is a shameful curse, harmful alike to body, soul and property." Grisar identifies this passage as a Table Talk statement: Mathesius, "Tischreden," p. 95. John Mathesius complied comments Luther made in 1540 (Table Talk statements numbered 4858 to 5341 found in WA, TR 4 and 5). The particular comment referred to by Wiener and Grisar is probably #4917. This is found translated into in English, LW 54:371-372. 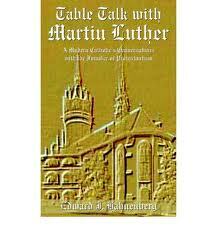 Keep in mind, anything identified as "Table Talk" are not statements written by Luther, but are rather purported to have been said by Luther. Luther, M. (1999, c1967). Vol. 54: Luther's works, vol. 54 : Table Talk (J. J. Pelikan, H. C. Oswald and H. T. Lehmann, Ed.). Luther's Works (54:371). Philadelphia: Fortress Press. Once again, the quote in context says something far different than the sentence presented by Peter Wiener. “What, therefore, shall we do? The secular government does not forbid it, the princes do nothing about it, and the rulers in the cities do nothing at all but wink at it and do the same themselves. We preach and the Holy Scriptures teach us otherwise; but you want to evade what is taught. Eating and drinking are not forbidden, but rather all food is a matter of freedom, even a modest drink for one’s pleasure. If you do not wish to conduct yourself this way, if you are going to go beyond this and be a born pig and guzzle beer and wine, then, if this cannot be stopped by the rulers, you must know that you cannot be saved. For God will not admit such piggish drinkers into the kingdom of heaven [cf. Gal. 5:19–21]. It is no wonder that all of you are beggars. How much money might not be saved [if excessive drinking were stopped].” [LW 51:293]. "Your sin can not cast you into hell." The link given for this quote goes over to a web page entitled, The Protestant Reformers Were Frauds (An Anabaptist speaks out). The web page states, "Martin Luther was not a great reformer like the history books teach, but he was a fraud! 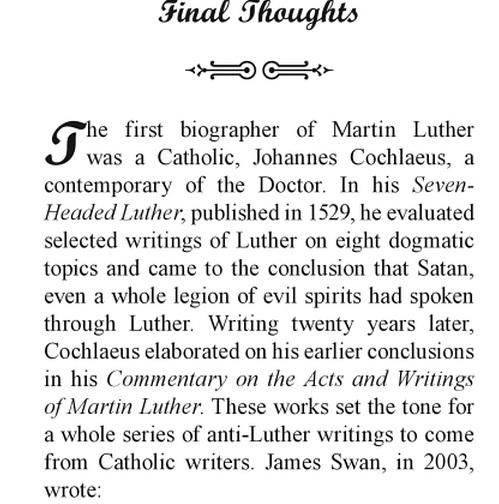 Here are some quotes from Luther which shows that he taught the heresy of Once Saved Always Saved," and thus follows a number of undocumented quotes from the Reformers. I did a basic search for "Your sin can not cast you into hell" across the Internet (with the spelling "can not") and came up with only one other relevant hit: some sort of Messianic Jewish web page: The Reformers (turn your computer's sound off for this page). This page likewise lacked meaningful documentation. One of these pages probably took the quote from the other. This quote appears to come from Luther's Church Postil, "Nineteenth Sunday after Trinity, Matthew 9:1-8 ( October 3, 1529). It can be found on this page. Luther begins by explaining that "external righteousness be urged both in admonitions and in threatenings, and not be considered as of no importance. For whosoever despises it, despises God and his Word." He explains that to live peacefully in this world with each other, we need to obey the ruling authorities and live honestly according to the second table of the Ten Commandments. If we don't, authorities have been set up to punish those who break the law. He then explains that the church of his day had set up false works said to be pleasing to God in order to obtain a right standing with him ("we tried all kinds of works, ran hither and thither, expended and wasted our energies, money and property; here we established masses and altars, there cloisters and brotherhoods, and every one was groping for the way in which he might serve God"). God though requires that whatever one does, however domestic and trivial it may seem, be done to His glory. All of this outward external righteous one engages in is because God commands it, not because one can earn righteousness or eternal salvation from it. 15. Therefore this doctrine, that our piety before God consists entirely in the forgiveness of sins, must be rightly comprehended and firmly maintained. We must therefore get beyond ourselves and ascend higher than our reason, which keeps us in conflict with ourselves and which reminds us both of sin and good works; and we must soar so high as to see neither sin nor good works, but be rooted and grounded in this article and see and know nothing besides. Therefore let grace or forgiveness be pitted not only against sin, but also against good works, and let all human righteousness and holiness be excluded. Thus there are in man two conflicting powers: Externally in this life he is to be pious, do good works, and the like, But if he aims beyond this life and wishes to deal with God, he must know that here neither his sin nor his piety avails anything. And though he may feel his sins which disturb his conscience, and although the law demands good works, he will not listen nor give heed to them, but will boldly reply; If I have sin, Christ has forgiveness; yea, I am seated on a throne to which sin cannot attain. 17. For wherever our nature succeeds in finding sin, it tries to make an unbearable burden of it. Satan fans the spark and blows up a great fire which fills heaven and earth. Here the leaf must be turned and we must firmly conclude: If the sin were ever so great or burdensome, this article of faith is nevertheless much higher, wider and greater, which has been recommended and established not by man's wisdom, but by him who has comprehended heaven and earth and holds them in the hollow of his hand. Is. 40, 12. My sin and piety must remain here on earth as far as they concern my life and conduct. But in heaven above I have another treasure, greater than either of these; there Christ is seated and holds me in his arms, covers me with his wings and overshadows me with his grace. 18. You may say: How is this, since I daily feel sin and my conscience condemns me and threatens me with God's wrath? I answer: For this reason, I say, one must understand that the righteousness of a Christian is nothing that can be named or imagined but the forgiveness of sin, that is, it is a kingdom of power which deals only with sin and with such abundant grace as takes away all wrath. It is called the forgiveness of sin for the reason that we are truly sinners before God; yes, everything in us is sin, even though we may have all human righteousness. For where God speaks of sin, there must be real and great sin; so also forgiveness is no jest, but real earnestness. When you, therefore, consider this article you have both. Sin takes away all your holiness, no matter how pious you are on earth; again, forgiveness takes away all sin and wrath. Therefore your sin cannot cast you into hell, nor can your piety elevate you into heaven. 19. Therefore, when the devil disturbs your conscience, and tries to bring despair to your heart by saying: "Have you not learned that one must be pious?" then answer courageously and say: Yes, you are right; I am a sinner, that I have known before; for this article, called the forgiveness of sins, has taught me this long ago. I am to be pious and do what I can before the world; but before God I am willing to be a sinner, and to be called nothing else, that this article may remain true, else there would not be forgiveness or grace; but it must needs be called a crown of righteousness and of merits. Therefore, although I feel nothing but many and great sins, yet they are no longer sins; for I have for them a precious panacea and drug which takes away the power and poison of sin and wholly destroys it. It is this word, "Forgiveness," before which sin disappears like stubbles before the fire. Without it no work, suffering, or martyrdom avails against the smallest sin. For without forgiveness sin is and remains pure sin, which condemns us. 20. Therefore only confess this article heartily and boldly and say: Before the world I may be pious and do everything that is required, but before God it is only sin according to this article. Therefore I am a sinner, but a sinner who now has forgiveness and who sits at the throne where grace rules supreme, Ps. 116. If this were not so I would be a sinner like Judas, who saw only his sin, but no forgiveness. But Christians, no matter how much sin they feel in themselves, in that word forgiveness see much more abundant grace presented to them, and poured out over them. Working through a quote like this is always a blessing, because it's nothing other than Luther expounding the Gospel and living the normal Christian life. If this was the context from which the quote comes from, it's sad that the websites which took it appear to have missed the Gospel which surrounds the quote. Luther says in the sermon, "...man's understanding cannot get beyond this external piety of works, and cannot comprehend the righteousness of faith." How true this is indeed. Luther: Not for a thousand years has God bestowed such great gifts on any bishop, such as those He bestowed on me! This paragraph is from multiple contexts. The sentence, "At Leipsic, at Augsburg, and at Worms, my spirit was as free as a flower of the field" is from 1524. It's found in LW 40:53 (Letter to the Princes of Saxony Concerning the Rebellious Spirit). The sentence about Jeremiah is from a different context also, Against the Heavenly Prophets in the Matter of Images and Sacraments (1525) [LW 40:144]. Then tacked on is a Table Talk comment from 1542.